Following requests for larger molds I am glad to announce that later this Autumn I am introducing several new traditional wooden molds to make authentic Dutch speculaas biscuits. Two of them will be large molds, including a woman and man mold in traditional Dutch clothing. The size of the molds is 25 x 7cm. A polder is a piece of land in a low-lying area that has been reclaimed from a body of water by building dikes and drainage canals. A large proportion of the west part of The Netherlands lies beneath sea level. The dykes and dunes protect the land from the risk of flooding. In earlier times there were no mechanical pumps, so polder mills ensured that the land was kept dry. In a polder mill there is a big scoop wheel that is put in motion by the blades of the mill. The scoop wheel carries the water away. 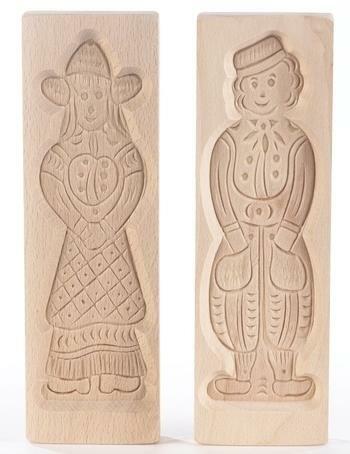 Later in the year you will have the opportunity to start making speculaas biscuits using these iconic molds. Make sure you follow me via Twitter or Instagram to be alerted when these molds become available. Alternatively become a subscriber of 'Speculaas News'. Happy speculaas spice baking times ahead.